Originally published in 1852 with Eccles. Appr. apply the words of the Apostle to the Hebrews: "For it was fitting that we should have such a high priest; holy, innocent, undefiled, separated from sinners." [Heb. 7: 26] A learned author observes that, according to Saint Paul, it was fitting that our Blessed Redeemer should not only be separated from sin, but also from sinners; according to the explanation of Saint Thomas, who says, 'that it was necessary that He, Who came to take away sins, should be separated from sinners, as to the fault under which Adam lay.' [3. p. q. iv. art. 6, ad 2] But how could Jesus Christ be said to be separated from sinners if He had a Mother who was a sinner? On the other hand, Saint Cyril of Alexandria asks, 'Who ever heard of an architect who built himself a temple, and yielded up the first possession of it to his greatest enemy? 'Moreover, we know,' says Saint Bernardine of Sienna, 'that the Divine Son came into the world more to redeem Mary than all other creatures.' There are two means by which a person may be redeemed, as Saint Augustine teaches us; the one by raising him up after having fallen, and the other by preventing him from falling; and this last means is doubtless the most honourable. 'He is more honourably redeemed,' says the learned Suarez, 'who is prevented from falling, than he who after falling is raised up;' for thus the injury or stain is avoided which the soul always contracts by falling. This being the case, we ought certainly to believe that Mary was redeemed in the more honourable way, and the one which became the Mother of God, as Saint Bonaventure remarks; 'for it is to be believed that the Holy Ghost, as a very special favour, redeemed and preserved her from Original Sin by a new kind of sanctification, and this in the very moment of her conception; not that sin was in her, but that it otherwise would have been.' The sermon from which this passage is taken is proved by Frassen to be really the work of the holy Doctor above named. On the same subject Cardinal Cusano elegantly remarks, that 'others had Jesus as a liberator, but to the most Blessed Virgin He was a pre-liberator;' meaning, that all others had a Redeemer Who delivered them from sin with which they were already defiled, but that the most Blessed Virgin had a Redeemer Who, because He was her Son, preserved her from ever being defiled by it. And now, had an excellent artist the power to make his bride such as he could represent her, what pains would he not take to render her as beautiful as possible! Who, then, can say that the Holy Ghost did otherwise with Mary, when He could make her who was to be His spouse as beautiful as it became Him that she should be? We know that this Divine Spouse loved Mary more than all the other Saints and Angels put together, as Father Suarez, with Saint Lawrence Justinian, and others, assert. He loved her from the very beginning, and exalted her in sanctity above all others, as it is expressed by David in the Psalms: "The foundations thereof are in the holy mountains: the Lord loveth the gates of Sion above all the tabernacles of Jacob . . . a man is born in her, and the Highest Himself hath founded her." [Ps. 87: 1, 5] Words which all signify that Mary was holy from her conception. The same thing is signified by other passages addressed to her by the Holy Ghost. In Proverbs we read, "Many daughters have gathered together riches: thou hast surpassed them all." [31: 29] If Mary has surpassed all others in the riches of grace, she must have had original justice, as Adam and the Angels had it. In the Canticles we read, "There are . . . young maidens without number. One is My dove, My perfect one" (in the Hebrew it is "My entire, My immaculate one") "is but one, she is the only one of her mother." [Cant. 6: 7, 8] All just souls are daughters of Divine grace; but amongst these Mary was the dove without the gall of sin, the perfect one without spot in her origin, the one conceived in grace. Hence it is that the Angel, before she became the Mother of God, already found her full of grace, and thus saluted her, "Hail, full of grace;" on which words Saint Sophronius writes, that 'grace is given partially to other Saints, but to the Blessed Virgin all was given.' So much so, says Saint Thomas, that 'grace not only rendered the soul, but even the flesh of Mary holy, so that this Blessed Virgin might be able to clothe the Eternal Word with it.' [Opusc. viii] Now all this leads us to the conclusion, that Mary, from the moment of her conception, was enriched and filled with Divine grace by the Holy Ghost, as Peter of Celles remarks, 'the plenitude of grace was in her; for from the very moment of her conception the whole grace of the Divinity overflowed upon her, by the outpouring of the Holy Ghost.' Hence Saint Peter Damian says, 'that the Holy Spirit was about to bear her off entirely to Himself, who was chosen and pre-elected by God.' The Saint says 'to bear her off,' to denote the holy velocity of the Divine Spirit, in being beforehand in making this Spouse His Own, before Lucifer should take possession of her. Finally, I wish to conclude this discourse, which I have prolonged beyond the limits of the others, because our Congregation has this Blessed Virgin Mary, precisely under the title of her Immaculate Conception, for its principal Patroness: I say that I wish to conclude by giving, in as few words as possible, the reasons which make me feel certain, and which, in my opinion, ought to convince everyone, of the truth of so pious a belief, and which is so glorious for the Divine Mother: that is, that she was free from Original Sin. There are many doctors who maintain that Mary was exempted from contracting even the debt of sin; for instance, Cardinal Galatino, Cardinal Cusano, De Ponte, Salazar, Catharinus, Novarino, Viva, De Lugo, Egidio, Richelio, and others. And, this opinion is also probable; for if it is true that the wills of all men were included in that of Adam, as being the head of all, and this opinion is maintained as probable by Gonet, Habert, and others, founded on the doctrine of Saint Paul, contained in the fifth chapter [v. 12] to the Romans. If this opinion, I say, is probable, it is also probable that Mary did not contract the debt of sin; for whilst God distinguished her from the common of men by so many graces, it ought to be piously believed that He did not include her will in that of Adam. This opinion is only probable, and I adhere to it as being more glorious for my sovereign Lady. But I consider the opinion that Mary did not contract the sin of Adam as certain; and it is considered so, and even as proximately definable as an article of faith (as they express it), by Cardinal Everard, Duval, Raynauld, Lossada, Viva, and many others. I omit, however, the revelations which confirm this belief, particularly those of Saint Bridget, which were approved of by Cardinal Turrecremata, and by four sovereign Pontiffs, and which are found in various parts of the sixth book of her Revelations. [Lib. vi, cap. 12, 49, 55] But on no account can I omit the opinions of the holy Fathers on this subject, whereby to show their unanimity in conceding this privilege to the Divine Mother. Saint Ambrose says, 'Receive me not from Sarah, but from Mary; that it may be an uncorrupted Virgin, a Virgin free by grace from every stain of sin.' Origen, speaking of Mary, asserts that 'she was not infected by the venomous breath of the serpent.' Saint Ephrem, that 'she was immaculate, and remote from all stain of sin.' An ancient writer, in a sermon, found amongst the works of Saint Augustine, on the words "Hail, full of grace," says, 'By these words the Angel shows that she was altogether [remark the word 'altogether'] excluded from the wrath of the first sentence, and restored to the full grace of blessing.' The author of an old work, called the Breviary of Saint Jerome, affirms that 'that cloud was never in darkness, but always in light.' Saint Cyprian, or whoever may be the author of the work on the 77th Psalm, says, 'Nor did justice endure that that vessel of election should be open to common injuries; for being far exalted above others, she partook of their nature, not of their sin.' Saint Amphilochius, that' He who formed the first Virgin without deformity, also made the second one without spot or sin.' Saint Sophronius, that 'the Virgin is therefore called immaculate, for in nothing was she corrupt.' Saint Ildephonsus argues, that 'it is evident that she was free from Original Sin.' Saint John Damascene says, that 'the serpent never had any access to this paradise.' Saint Peter Damian, that 'the flesh of the Virgin, taken from Adam, did not admit of the stain of Adam.' Saint Bruno affirms, 'that Mary is that uncorrupted earth which God blessed, and was therefore free from all contagion of sin.' Saint Bonaventure, 'that our Sovereign Lady was full of preventing grace for her sanctification'; that is, preservative grace against the corruption of Original Sin. Saint Bernardine of Sienna argues, that 'it is not to be believed that He, the Son of God, would be born of a Virgin, and take her flesh, were she in the slightest degree stained with Original sin.' Saint Lawrence Justinian affirms, 'that she was prevented in blessings from her very conception.' And the blessed Raymond Jordano, on the words "Thou hast found grace," says, 'thou hast found a singular grace, O most sweet Virgin, that of preservation from Original Sin,' . . . And many other Doctors speak in the same sense. But finally, there are two arguments that conclusively prove the truth of this pious belief. The first of these is the universal concurrence of the faithful. Father Egidius, of the Presentation, assures us that all the religious orders follow this opinion; and a modern author tells us that though there are ninety-two writers of the order of Saint Dominic against it, nevertheless there are a hundred and thirty-six in favour of it, even in that religious body. But that which above all should persuade us that our pious belief is in accordance with the general sentiment of Catholics is, that we are assured of it in the celebrated bull of Alexander VII, 'Sollicitudo omnium ecclesiarum,' published in 1661, in which he says, 'This devotion and homage towards the Mother of God was again increased and propagated. . . . so that the universities having adopted this opinion' (that is, the pious one), already nearly all Catholics have embraced it.' And in fact this opinion is defended in the universities of the Sorbonne, Alcala, Salanlanca, Coimbra, Cologne, Mentz, Naples, and many others, in which all who take their degrees are obliged to swear that they will defend the doctrine of Mary's Immaculate Conception. The learned Petavius mainly rests his proofs of the truth of this doctrine on the argument taken from the general sentiment of the faithful. An argument, writes the most learned bishop Julius Torni, which cannot do otherwise than convince; for, in fact, if nothing else does, the general consent of the faithful makes us certain of the sanctification of Mary in her mother's womb, and of her Assumption, in body and soul, into Heaven. Why, then, should not the same general feeling and belief, on the part of the faithful, also make us certain of her Immaculate Conception? The second reason, and which is stronger than the first, that convinces us that Mary was exempt from Original Sin, is the celebration of her Immaculate Conception commanded by the universal Church. And on this subject I see, on the one hand, that the Church celebrates the first moment in which her soul was created and infused into her body; for this was declared by Alexander VII, in the above-named bull, in which he says that the Church gives the same homage to Mary in her Conception, which is given to her by those who hold the pious belief that she was conceived without Original Sin. On the other hand, I hold it as certain, that the Church cannot celebrate anything ,which is not holy, according to the doctrine of the holy Pope Saint Leo and that of the Sovereign Pontiff Saint Eusebius: 'In the Apostolic See the Catholic religion was always preserved spotless.' All theologians, with Saint Augustine, Saint Bernard, and Saint Thomas, agree on this point; and the latter, to prove that Mary was sanctified before her birth, makes use of this very argument: 'The Church celebrates the nativity of the Blessed Virgin; but a feast is celebrated only for a Saint: therefore the Blessed Virgin was sanctified in her mother's womb. But if it is certain, as the angelic Doctor says, that Mary was sanctified in her mother's womb, because it is only on that supposition that the Church can celebrate her nativity, why are we not to consider it as equally certain that Mary was preserved from Original Sin from the first moment of her conception, knowing as we do, that it is in this sense that the Church herself celebrates the feast? 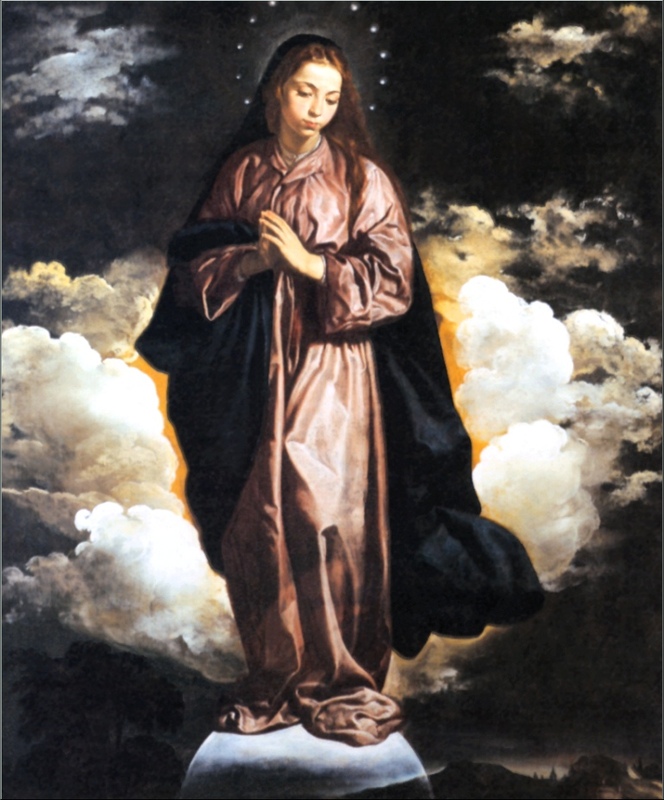 And finally, in confirmation of this great privilege of Mary, ee may be allowed to add the well-known innumerable and prodigious graces that our Lord is daily pleased to dispense throughout the kingdom of Naples, by means of the pictures of her Immaculate Conception. I could refer to many which passed, so to say, through the hands of fathers of our own Congregation; but I will content myself with two which are truly admirable. A woman came to a house of our little Congregation in this kingdom to let one of the fathers know that her husband had not been to confession for many years, and the poor creature could no longer tell by what means to bring him to his duty; for if she named confession to him, he beat her. The father told her to give him a picture of Mary Immaculate. In the evening the woman once more begged her husband to go to confession; but as he as usual turned a deaf ear to her entreaties, she gave him the picture. Behold! he had scarcely received it, when he said, 'Well, when will you take me to confession, for I am willing to go? The wife, on seeing this instantaneous change, began to weep for joy. In the morning he really came to our church, and when the father asked him how long it was since he had been to confession, he answered twenty-eight years. The father again asked him what had induced him to come that morning. 'Father,' he replied, ' I was obstinate; but last night my wife gave me a picture of our Blessed Lady, and in the same moment I felt my heart changed, so much so, that during the whole night every moment seemed a thousand years, so great was my desire to go to confession.' He then confessed his sins with great contrition, changed his life, and continued for a long time to go frequently to confession to the same father. In another place, in the diocese of Salerno, in which we were giving a mission, there was a man who bore a great hatred to another who had offended him. One of our fathers spoke to him that he might be reconciled; but he answered: 'Father, did you ever see me at the sermons? No, and for this very reason, I do not go. I know that I am damned; but nothing else will satisfy me, I must have revenge.' The father did all that he could to convert him; but seeing that he lost his time, he said, 'Here, take this picture of our Blessed Lady.' The man at first replied, 'But what is the use of this picture?' But no sooner had he taken it, than, as if he had never refused to be reconciled, he said to the missionary, 'Father, is anything else required besides reconciliation? I am willing.' The following morning was fixed for it. When, however, the time came, he had again changed, and would do nothing. The father offered him another picture, but he refused it; but at length, with great reluctance, took it, when, behold! he scarcely had possession of it than he immediately said, 'Now let us be quick; where is Mastrodati?' And he was instantly reconciled with him, and then went to confession.